The story of Anonymous hasn't been told because it's probably just begun. But the documentary We Are Legion: The Story of the Hacktivists is a really good beginning to that story. Told with interviews from actual Anonymous members, both masked and out in the open, filmmaker Brian Knappenberger delves into the humble origins of the group and follows its flirtation with nobility and notoriety. 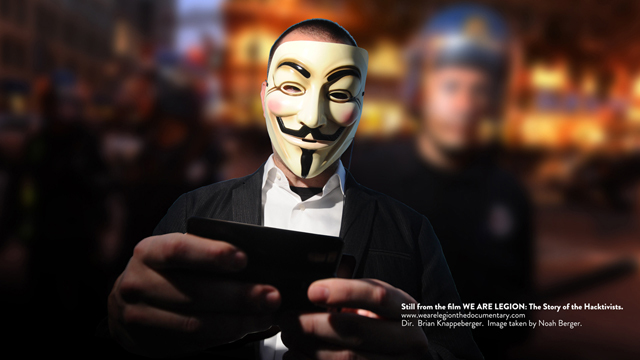 Anonymous is an online community that has organized everything from creating armies of suspicious avatars in children's games to organizing real world protests against Scientology to shutting down Paypal. "Are they good or bad? How are they evolving," asked Knappenberger when I spoke with him earlier this week. "Some of them realized the chaos can be used for something good, then there was a split." Knappenberger wasn't part of Anonymous, so he was learning as he was making the documentary, which he started back in 2008 and is screening this week in New York and Los Angeles. The film will be available online on October 30th. "What's surprising is how much discussion there is behind the scenes. It looks misleadingly organized," said Knappenberger. "They seem united when their stunts reach the public ... There's a lot of discussion as to what targets are OK to hit." The ethical dilemmas are the crux of the documentary and what makes it such an interesting piece. Watch with friends because you're going to want to quibble over Anonymous's tactics. Are they Robin Hood or the Joker? Are they protectors of free speech or guilty of suppressing it? What role do they have in exposing government secrets and do those governments have the right to distribute harsh punishments for their crimes. Knappenberger selects interesting interviewees, all very smart, some are the culprits in high profile hacks and are currently being prosecuted. Knappenberger weaves the story so that he's appealing to your sense of justice, even though you know that Anonymous' actions are illegal. The film blurs the line between these activists' online anonymity and their real world identity and makes you want to join the cause.